Help Google find your pages and content. In Dolphin 7 we now have many more rss feeds and capabilities, then we did in the previous version. These new rss feeds can be used to your benefit in a variety of ways. One thing you can do with them is use them to tell Google where to find your pages. 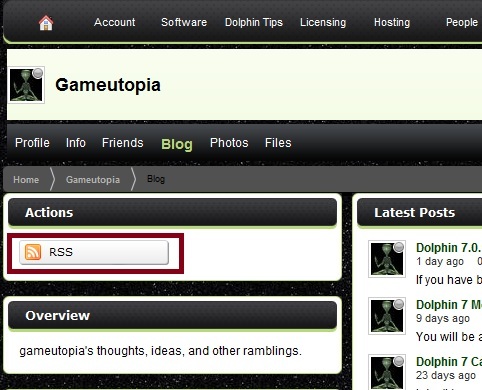 Some of the more common rss feeds that your Dolphin 7 site has are blogs, articles, news, and even a forum posts. What you can do with these rss feed is use them just like a sitemap in Google Webmaster Tools. Simply add the feeds to your Google Webmaster Tools account just like a standard sitemap.xml. Google reads most standard rss feeds. By doing this, you are informing Google where to find your posts. If you post a new article it is automatically added to your sites rss feed, and next time Google visits your article rss feed it will know where to find your new article. There is no guarantee that Google will add your posts to the index, but at least you are helping Google find them. After you submit them to Google Webmaster Tools, in the Sitemap section of your account they will show a maximum of 11 most recent. Once Google downloads them it will then tell you how many are actually indexed into Google Search. Sometimes this takes a few minutes, and other times it takes a couple of days for Google to update this in your account. Here is a screen shot from my Google Webmaster Tools Account. You can see that I do get a warning for the articles rss feeds I have added. They are still being read by Google, but I get a warning because Google doesn't like the code for the date in the feed. Hopefully Boonex addresses this, so the warning goes away. They are still being read and downloaded by Google, which is what I am after anyway. Google just don't like the way Boonex has coded the date format for some reason for the article feeds. You can see that of the most recent or last 11 articles in my rss feed 4 are indexed into Google search. My recent forum posts have 1 indexed, and my blogs have 6 indexed. In the second image a week or so later you can see more pages have been indexed. This doesn't include all my blogs, articles, or forums. Since the rss feed only has the most recent 11 posts the numbers reflect this only. If you have other members actively posting blogs you can add a rss feed in Google Webmaster Tools for the particular members blog posts too. There are other rss feeds in Dolphin 7 you could potentially add too. The forum rss feed I mentioned above is the most recent 11 posts of your entire forum. If you had an active forum and wanted to add a rss feed to Google for each category or forum topic you could do that too. If you add other modules that have rss feeds same thing, you can add them as well. Anything you can do to help Google find your site and links is generally worth the effort. Once you set these up you really don't have to update them or do anything else with them. Just check your Google Webmaster Tools account if you want to see if Google is indexing them or how many have been indexed. Most appear to be read by Google, but with warnings. Even though some have warnings in Google Webmaster Tools they are still being read and crawled by Google just fine. Hopefully once Dolphin 7.0.1 is available the warning in Google Webmaster Tools will go away.